"5 Ways How Edge Could Transform Your Businesses"
"Transforming Your Business Using Machine Learning"
For any app to distinguish itself, it needs to be the best quality, and that requires flawless design and thorough testing. Mobile app testing in app development plays a key role to ensure that your mobile app meets your business goals. At the same time, the poorly designed mobile app testing strategies can seriously back-fire, or even negatively impact your brand value and ROI. Only a few tactics will really skyrocket your app and expand your user base exponentially, therefore, you have to plan an effective mobile testing strategy to grow your business. For your app to gain traction, it’s important to make sure that you test it properly with the right mobile testing strategies. 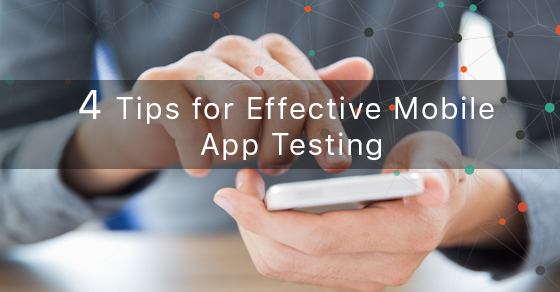 We’ve got four tips that every testing team should keep in mind in order to reap the most from the QA efforts for testing mobile apps. Perform real device testing to capture the baseline test metrics and the device resource utilization (CPU, memory, storage, and battery) impact on the performance. Mobile devices will have limitations in terms of processing power, memory and battery, which will have a significant impact on the user’s perception of performance. Henceforth it is strongly recommended to test the performance on real devices. Use real devices to find out how your app work on different signal strengths, switching between core functions of the devices, multi-tasking with other apps, and running on different network carriers. While planning and executing performance testing of mobile applications, keeping the above parameters into consideration to get an effective testing of any issues that the end users may encounter while using the app. Testing to find defects or bugs is time-consuming, expensive, often repetitive, and subject to manual errors. Automated testing will run in-depth and data-intensive tests automatically to improve app quality by shortening your development span. Automated testing ensures that your testing is successful and you will get the maximum ROI. But not every test should be automated. Test Automation tools help to speed up testing, to test substantially more code, improve test accuracy, save configurations before running tests, and reuse them whenever needed. Plus test automation frees up QA team to focus on testing that requires unique human skills and manual attention. To capture the realistic user experience, performance testing of the mobile application with different devices is extremely important as each device has its own capabilities. Hence it is strongly recommended to test the app on a wide variety of devices and different platforms that are supported by the app to ensure high-quality performance while simulating the load through identified scenarios. You need to look at a lot of different scenarios to analyze and find all the possible load and performance issues. Mobile devices operate in a range of different conditions so select testing method based on form factor, operating system, or even popularity in your target market. Automating your test cases is a decent, sound-minded approach, but don’t rely on automation alone. The best practice is to mix both manual and automated techniques all along the testing process since each of them has its strong points and its weaknesses. Because automated tests can’t evaluate user experience. It won’t be able to spot the hassles that may become a turn-off for your future users. So use mobile-specific tools as you need to find all the possible bugs. Testing mobile apps is a never-ending task, but smart testers know when to wind up testing and release an app. However, you can't deny the benefit of effective mobile application testing. The perfect combination of the strategies and tools will ensure to take advantage of your mobile apps and not a liability for your business. In this regard, all the above-mentioned tips should be taken into account in order to perform qualitative mobile app testing in a streamlined way.